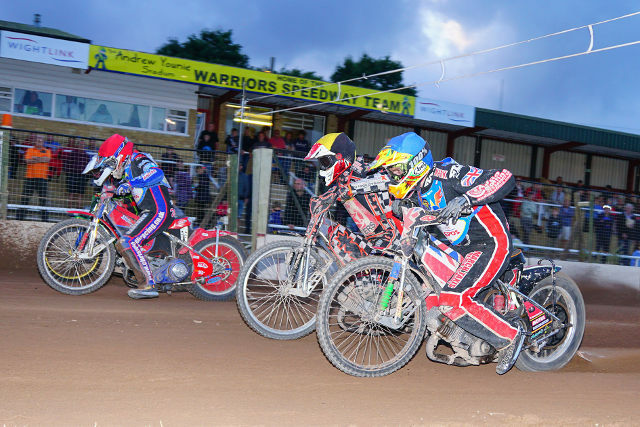 This Thursday (12th) sees the return of Speedway to Smallbrook Stadium – the Wightlink Warriors team hope to get their 2018 season underway by entertaining League Champions, Belle Vue Colts. After several weather wrecked attempts to get on-track, the Isle of Wight ‘Wightlink’ Warriors speedway team hope to get their 2018 season underway this Thursday (12th) when they are scheduled to entertain the League Champions, Belle Vue Colts. The Colts were the outstanding team in the 2017 National League and displayed impressive fire power when recording a 34 point win at The Andrew Younie stadium last August, however this year has necessitated a change of personnel for the Manchester men as several of the Championship team have either moved into higher leagues, transferred to other teams or been prevented from returning due to injury. Two key building blocks from 2017 returning this year are the highly talented duo of Jack Smith and Kyle Bickley. They provide the sound foundations for a team boosted by the signing of former Islander, Tom Perry, who has moved north from Cradley. If the Colts do have an Achilles heel, it might be linked to their decision to track three inexperienced three point riders in their seven to balance the top end strength of the heat leaders. This won’t have been lost on Warriors Team Manager Jackie Vatcher who will be keen for her charges to get off to a quick start and in new number one Ben Morley the Warriors have a rider who has been able to get in some valuable match practice with his Championship side Lakeside. “I can’t remember a more disjointed start to a season. The atrocious weather has been so frustrating, however it just heightens our anticipation and we could hardly ask for a better or more exciting fixture to open up with. Warriors (from): Scott Campos, Ben Hopwood, Ben Morley, Adam Portwood, Jamie Sealey, Danno Verge and Chris Widman. Colts (from): Paul Bowen, Kyle Bickley, Kean Dicken, Joe Lawlor, Tom Perry, Jack Smith and Ben Woodhull. Usual admission arrangements apply with the turnstiles opening at 5.30pm and the pits open for viewing from 5.45pm to 6.15pm. The grand parade of riders will take place at 6.45pm with tapes up on the first race at 7pm. The ever-popular kid’s on-track cycle/running race will also feature during the speedway interval.